Purpose: Public beach recreation and shore protection. The Yorktown Public Beach is located on the south side of the York River and is approximately 1,200 feet in length. Historically, the beach was a product of erosion of nearby sandy upland banks and the littoral transport system. Over the years, the beaches along the waterfront began to narrow as the natural sediment supply was depleted by hardening of the updrift shorelines. Beaches were easily overwashed in storms, and they continued to erode. The nearshore closest to the Colman Memorial Bridge is very deep as the river narrows. The channel under the bridge is naturally 90 ft deep. Downriver, the nearshore widens toward the National Park Service property. Although the winter northwesters are strong, the long fetch to the east into the Bay and the shoreline morphology indicate a unidirectional wind/wave setting. In 1978, York County installed a riprap revetment along its picnic area shore to the east end of Yorktown. This area had been filled in Colonial days to expand the warehousing facilities at the Port of Yorktown. After a damaging storm in November 1985, a small breakwater with beach nourishment was installed in order to maintain a storm water outfall. Subsequent renourishment occurred three years later. In September 1994, York County installed Phase I of an offshore breakwater system which consisted of two shore-attached breakwaters. These breakwaters, 140 and 120 feet in length, were coupled with 7,500 cubic yards of beach fill and plantings of Spartina alterniflora and S. patens in the lee of the structure. The pre-existing breakwater was modified to interface the system on the downstream end and the 120 foot breakwater has a falling crest elevation to encourage wave refraction, and a winged breakwater was designed to achieve a reasonable interface with the adjacent shore and reduce potential wave force impacts during northeasters. In May 1996, approximately 600 cubic yards of sand was dredged from under the Coleman Bridge as part of the bridge widening project. This sand was subsequently used as beach fill on Yorktown Beach. In the fall/winter of 1998-1999, Phase II of the Shore Erosion Control Plan was implemented along the shoreline. Two winged, headland breakwaters, 120 and 130 ft in length, were constructed downriver from the existing breakwaters. The small breakwater built in 1986 to stabilize the storm water outfall was removed in order to establish a better breakwater gap-to-bay indentation ratio for the new system. The storm water outfall pipe was relocated through one of the new breakwaters. In addition, approximately 10,000 cubic yards of sand was placed on the beach, and beach grasses were planted behind the structures. Phase III of breakwater construction began in June 2000. 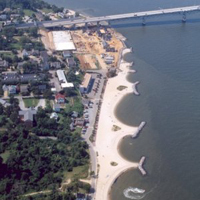 The completed project included three new breakwaters, beach fill along the Yorktown waterfront, and a revetment. Since then, the wharf where the old post office sat was removed. Two smaller breakwaters, 80 and 85 ft in length were positioned at the far west of the reach. A larger winged, headland breakwater, 150 ft in crest length, was installed as well, and beach grasses were planted behind it. The existing revetment on the upriver end of the site was repaired and a new section was added toward the west. Along with the breakwater construction, a new walkway adjacent to the Water Street was added. Since then, an additional two breakwaters have been built on the upriver end of the site, and in 2005, three more were constructed upriver and one more downriver.